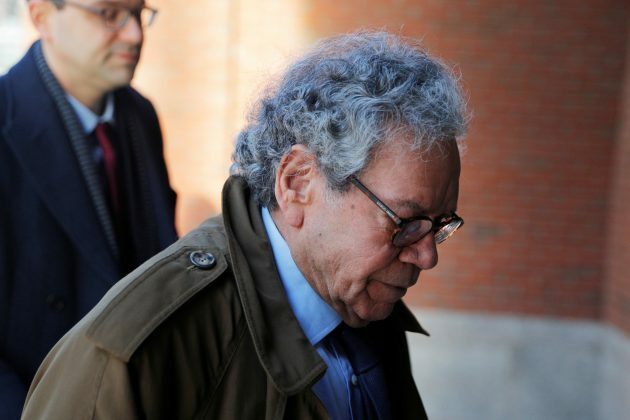 BOSTON (Reuters) – Insys Therapeutics Inc’s one-time billionaire founder directed a vast scheme to bribe doctors to prescribe an addictive fentanyl spray as opioid addiction was spiraling into a public health crisis, a U.S. prosecutor said on Monday. John Kapoor, the company’s former chairman, and four colleagues are the first painkiller manufacturer executives to face trial over conduct authorities say contributed to the U.S. opioid epidemic, which officials said killed more than 47,000 people in 2017. Kapoor, who was also Insys’ chief executive from 2015 to 2017, turned the company into a “criminal enterprise” that paid doctors millions of dollars to push its drug, Assistant U.S. Attorney David Lazarus told jurors in Boston federal court. “John Kapoor and his co-defendants paid doctors to abandon their medical duties,” Lazarus said. Kapoor, 75, and former Insys executives and managers Michael Gurry, Richard Simon, Sunrise Lee and Joseph Rowan have pleaded not guilty to racketeering conspiracy. Defense lawyers will deliver their own opening statements later on Monday. Kapoor’s 2017 arrest came the same day U.S. President Donald Trump declared the opioid crisis a public health emergency. In 2017, a record 47,600 people died of opioid-related overdoses, according to the U.S. Centers for Disease Control and Prevention. Two top former executives – Michael Babich, Insys’ CEO from 2011 to 2015, and Alec Burlakoff, its ex-vice president of sales – have become government witnesses after pleading guilty to carrying out the scheme at Kapoor’s direction. Lazarus told jurors that from 2012 to 2015, Kapoor and his co-defendants conspired to pay doctors bribes in exchange for prescribing Subsys, an under-the-tongue fentanyl spray approved only for use in managing severe pain in cancer patients. Fentanyl is an opioid 100 times stronger than morphine. Insys paid doctors as much as $275,000 in one case to participate in speaker programs ostensibly meant to educate medical professionals about Subsys but that were actually poorly attended sham events, Lazarus said. The scheme led doctors to write medically unnecessary prescriptions for Subsys to patients, many of whom did not have cancer, Lazarus said. He said Kapoor also participated in a scheme to defraud insurers into paying for the expensive drug. Insys in August said it would pay at least $150 million to resolve a Justice Department probe related to its marketing of Subsys, and that it has taken steps to ensure it operates legally going forward. This entry was tagged addictive fentanyl spray, Bribes, criminal enterprise, Doctors, opiod addiction, Painkillers, public health crisis. Bookmark the permalink.